Density is a key physical property of matter in fields such as chemistry and engineering. While you cannot measure the density of a solid material without the use of special equipment, you can use the definition of density to find it indirectly. Density is the mass of a substance per unit of volume, so if you measure both mass and volume of a given sample, you can calculate its density by dividing mass by volume. In order to classify and identify materials of a wide variety, scientists use numbers called physical constants (e.g. density, melting point, boiling point, index of refraction) which are characteristic of the material in question. These constants do not vary with the amount or shape of the material, and are therefore useful in positively identifying unknown materials. Standard reference works have been complied containing lists of data for a wide variety of substances. The chemist makes use of this in determining the identity of an unknown substance, by measuring the appropriate physical constants in the laboratory, consulting the scientific literature, and then comparing the measured physical constants with the values for known materials. This experiment illustrates several approaches to the measurement of the density of solids. To determine the density of a solid (which is denser than water) by using a spring balance and a measuring cylinder. All matter has mass and volume. Mass and volume are the physical properties of matter and may vary with different objects The amount of matter contained in an object is called mass. Its measure is usually given in grams (g) or kilograms (kg). Volume is the amount of space occupied by an object. The units for volume including liters (l), meters cubed (m3), and gallons (gal). Consider two different substances such as iron and cotton of same mass. 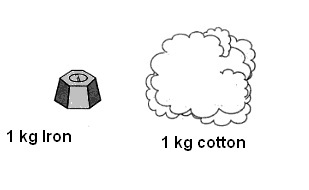 It is observed that Iron will occupy less volume as compared to cotton. This is due to their differences in density. Density of Iron is more than that of cotton. The mass of a unit volume of a substance is called its density. In S.I units density is expressed in kg m -3. For example, density of water is 1000 kg m-3. Density of iron is 8500 kg m-3. Most of the substances expand on heating and contract on cooling, but the mass remaining constant for all cases. The density of most of the substances decreases with the increase in temperature and increases with decrease in temperature. But water contracts when cooled up to 40C but expands when cooled further below 40C . Thus the density of water is maximum at 40C. Relative density of a substance is defined as the ratio between the density of the substance to the density of water at 40C. Relative density is also known as specific gravity. The relative density of a substance is a pure number without any unit. It tells how many times a substance is heavier than water. Relative density (R.D) of a substance can be calculated by dividing density of a substance with the density of water. Thus, Relative density of iron is 8.5 (No unit is applied). Density of a substance can be calculated by multiplying Relative Density (R.D.) of the substance with the Density of water. It is a device used for the determination of gravitational mass of a body. It works on the principle of Hooks law of elasticity which states that when a body is suspended from a vertical spring, the body produces extension in the length of the spring proportional to its gravitational mass. How to measure the gravitational mass of a solid using a spring balance? •	Take a metallic solid block. •	Tie it with a thin strong thread to hang it on the hook of the spring balance. •	Note the least count of the spring balance. •	Hang the block on the hook of spring balance. It is better to hang the spring balance with the help of an iron stand or clamp stand so that it remains static while noting the mass of the block. •	Carefully observe the gravitational mass of the solid block and note it down. Repeat it thrice and calculate mean of the three readings taken. Now we need to find the Mass of the solid. •	Take a graduated glass cylinder of proper size and capacity. Fill it with water up to a known volume level mark. •	Tie the rectangular metallic block by a thin strong thread and immerse it fully in water taken in the graduated cylinder. The block displaces water and the water level rises. Note the position of water level (meniscus) keeping the eye in horizontal position with the level (to avoid error due to parallax). 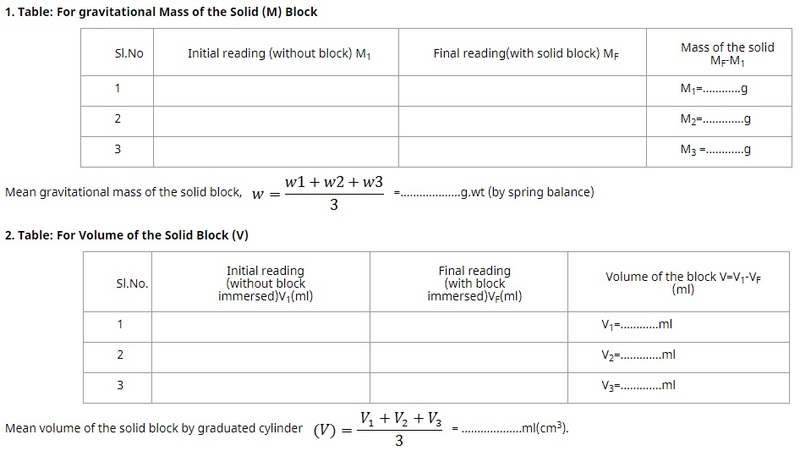 •	Find the difference of two positions of the water level to find volume of metallic block immersed. •	Repeat it thrice and calculate the mean of three observations taken. Record your observation of measurement of mass and volume in the below tables as shown. When the experiment is conducted in earth as environment, the mass of the object and gravitational mass displayed on the spring balance is the same. But when we do it on another planet like moon, mars, etc., the mass of object and gravitational mass are different. The mass displayed in the spring balance is taken as gravitational mass (w) of the object and the mass of object can be calculated by using the formula. You can calculate the density (D) of the given solid block (denser than water) with the calculated mean mass and volume. Always used a thread of least weight and volume to tie the solid block. The solid block should be dried before measuring mass and volume. The indicator of the spring balance should be at zero before measuring the mass of the solid. The solid block should be completely immersed in water of the measuring cylinder before observing its volume. While immersing the solid block, the water of the measuring cylinder should not spill. The solid block should not touch the brim and sides of the beaker. Always note reading of lower meniscus of water level.